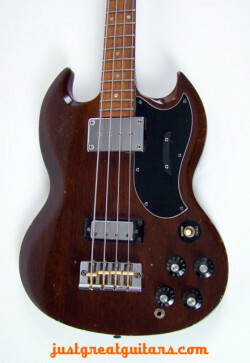 The Epiphone Guitar Company (which was bought out by Gibson in 1957) produced some of the best sounding and highest quality solid body guitars (and basses) throughout the 1960’s. 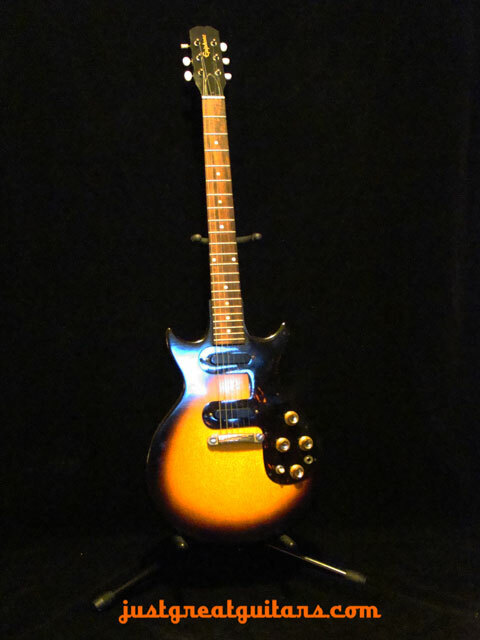 The Epiphone Olympic was originally designed in a very similar fashion to the Gibson Les Paul Special Double Cut and was later redeveloped with a new and more futuristic body shape to more closely match the company’s Coronet and Wilshire solid bodies in 1963. 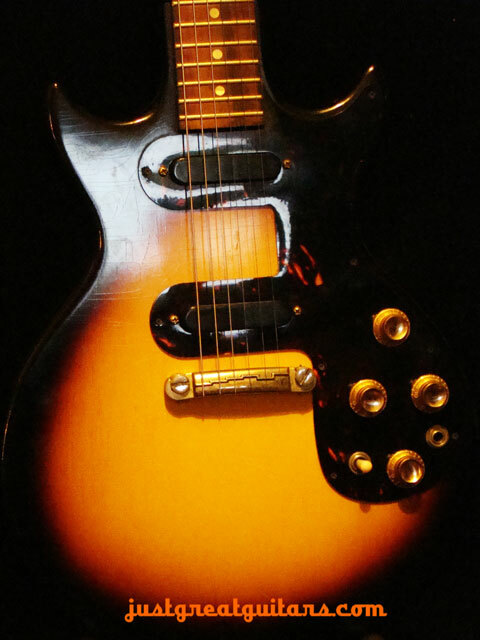 The Epiphone Olympic Double was originally designed in a very similar fashion to the Gibson Les Paul Special Double Cut and was later redeveloped with a new and more futuristic body shape to more closely match the company’s Coronet and Wilshire solid bodies in 1963. 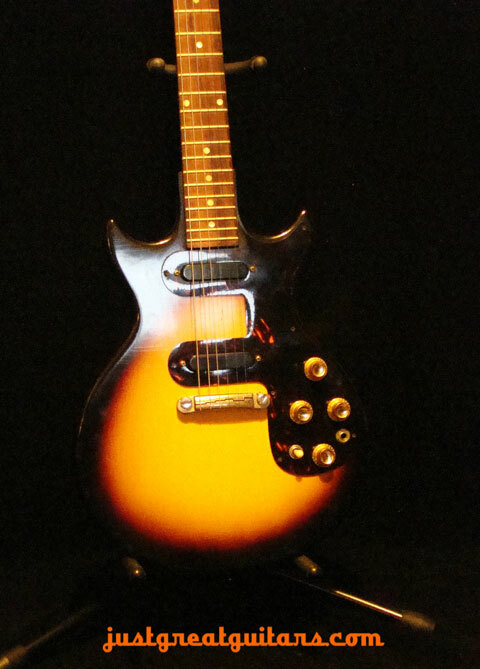 The Epiphone Olympic was Epiphone’s best selling (Kalamazoo-built) guitar, shipping almost 10,000 instruments between 1960 and 1969. The 1960 – 62 Olympic Double model featured two single coil pickups mounted within the celluloid pickguard in two prong-like shapes offering a very sleek and modern design that wouldn’t look out of place in the current guitar market. 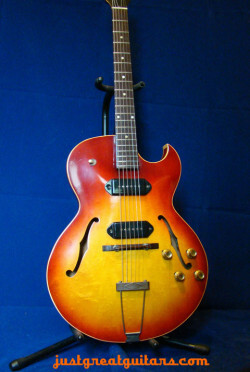 This guitar is very comfortable to play due to its thin body and double cutaway. 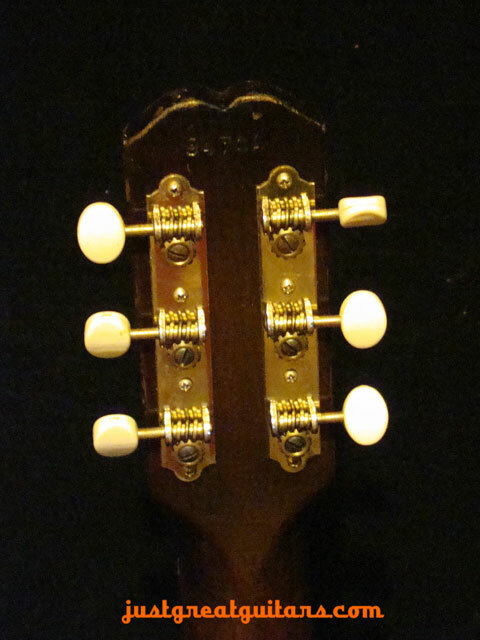 Access to the upper frets is exceptionally easy and it sports a slim and fast fingerboard. The action is low but without any buzzes and blues-rock players especially will adore the ease with which you can bend strings. 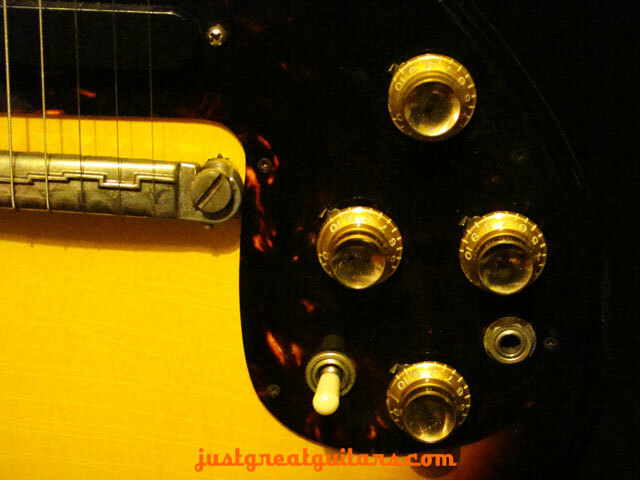 Tonally, this guitar can cover a lot of sonic ground with its twin single coils and we found everything from smooth jazz tones to blues rock/hard rock and even country flavours when we first plugged in. There is a great natural sustain evident with this guitar even when played clean which puts you in mind of much heavier Les Paul’s. Crank up the volume with this guitar and it would give a lot of modern ‘boutique’ rock guitars a good run for their money. Gary Moore or Joe Bonamassa tones are very easy to find here. 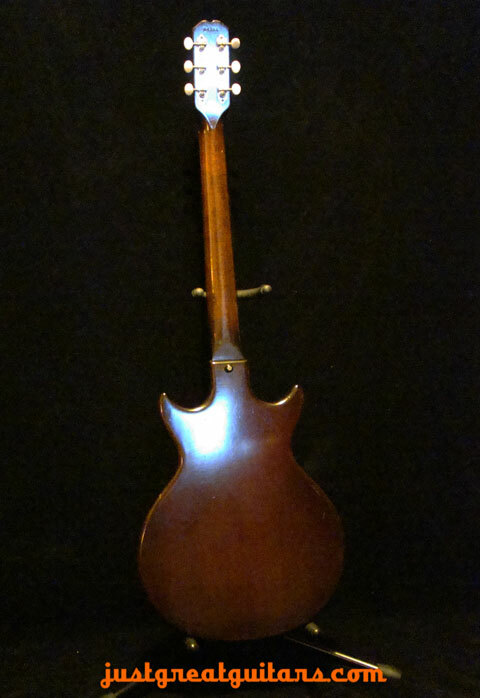 The guitar is in very good condition with only minor dings in the finish and it’s really quite hard to believe that it is over 50 years old. 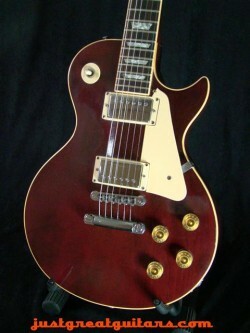 An added bonus with the body shape and weight of this guitar is that you won’t get the ‘neck fatigue’ that occurs with Les Paul’s for example and this should appeal to gigging musicians especially. A great solid body from a legendary company that will appeal to players from a whole variety of musical styles. 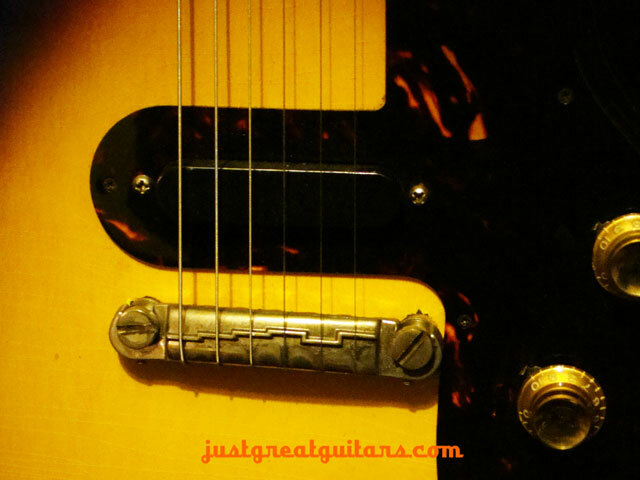 This guitar provides a more affordable alternative to a Les Paul Jr. (and some might even argue is a better instrument) Great tone, superb playability and very versatile all in one package.